If you’re like me, you love breakfast food. You love nothing more than starting your day off with bacon, eggs, and the occasional pancake or ten. Pancakes and bacon deserve respect. If they’re the best part of your day, you ought to at least prepare them in the proper manner. There are far too many bad electric griddles out there. I’m tired of seeing and hearing about griddles that flood out grease or warp from overuse. I’m tired of hearing about griddles that just can’t properly heat up or of griddles that try to be so much more than they are. It’s a griddle. It’s a very simple thing. You need a nice flat surface that can evenly heat up and keep grease far away. That’s really all you need. If you see these griddles out here that try to be so much more, they’re just trying to sell you an inferior product wrapped up in unnecessary fanciness. 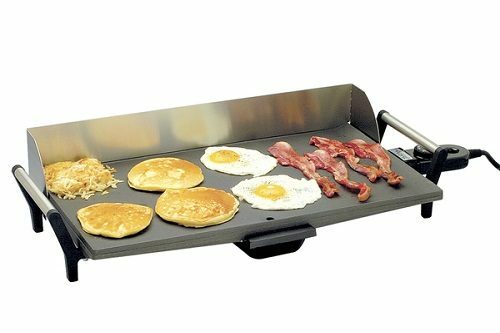 You can buy a cheap 20 dollar griddle. It’s out there, I know they exist, but maybe they shouldn’t be allowed to. If you check the reviews, you will know that people get sucked in by low prices only to regret it when they find their griddle melting in half. If you’re looking for a good deal on a great quality griddle I suggest you look into the Broil King PCG-10 Professional Portable Nonstick Griddle. The Broil King isn’t trying to offer you the world. It’s not trying to tell you that it will replace everything in your kitchen. It just wants to cook you some breakfast. Removable Backsplash - A removable stainless steel backsplash helps keep you and your kitchen grease free. 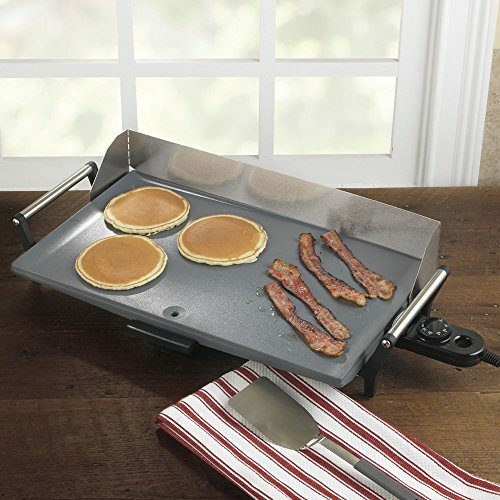 Large Nonstick Surface - 21 by 12 inches gives you enough room to whip up breakfast for the whole family. The nonstick surface is great and convenient allowing cooking and cleaning both to be easier. 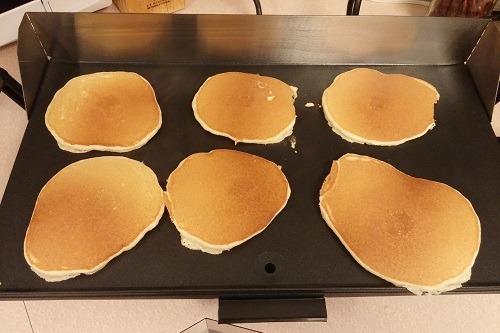 ​PFTOA & PTFE Free - Griddles can possibly contain harmful chemicals in the nonstick surface. Watch out for both of these as they are both hazardous to your health. The Broil King contains neither. Grease Tray - The back legs help push grease towards the tray which is then removable and easy to wash. There aren’t extra features. The Broil King isn’t trying to trick or seduce you. It’s an honest piece of equipment that focuses on quality. If the Broil King could talk, it wouldn’t speak much. It would much rather rely on its actions to speak for it. The Broil King has some of the best feedback on the internet. It has a 4.2 star rating on Amazon at the time of this review. For starters it is a very large griddle. Make no mistake, if you don’t have the room to store it, this grill may not be for you. It’s large enough to comfortably cook 8 pancakes at the same time. Many of the extremely positive reviews came from families who religiously held sunday pancake breakfast. The first thing I did was cook 8 pancakes. Out of all the electric griddles on the market, this one cooks the most even. Uneven cooking is perhaps the biggest problem with the electric griddles, but the Broil King tackles this issue well. There is some heat drop off near the very edge, as the edge of the pancakes on the end cooked a little slower. It wasn’t terrible and you may not even notice it, unless you cook eight pancakes at the same time. Only a true American made griddle like the Broil King can understand the heavy needs of a bacon and pancake enthusiast like myself. None of the long term reviews I read spoke to the griddle warping or bending. Not a single one mentioned this common griddle problem. The griddle does come in a little pricey compared to some of the cheaper griddles, but that’s because it is committed to excellence. It cooks better and heats up faster than most other griddles. The temperature settings are great, and it really will self regulate and keep your griddle at the appropriate temperature. I was skeptical about the nonstick surface at first. It seems like there are lines on the griddle, and I was worried it might affect the cooking. It turned out they didn’t do much and after a few weeks of use, the lines began to fade away. It’s not perfect though. There aren’t any rubber feet, you think that this would be a simple decision, but it makes the feet of the griddle a little less stable than I wish. I didn’t end up using the splash guard, but it seems other people were satisfied with this addition. I didn’t use it, but some found that it is flimsy. They could have invested a little bit more into making a grease tray that is less flimsy and easier to remove, but it at least gets the job done. The cooking quality is better than most, and that’s why in the end I highly recommend the Broil King. The best place to buy the Broil King is Amazon. It will run you right around a hundred dollars. This is on the higher end of electric griddles, but there’s nothing that even comes close to it in the fifty dollar range. If you want the even quality cooking of the Broil King, I’m afraid you will have to pay the price. 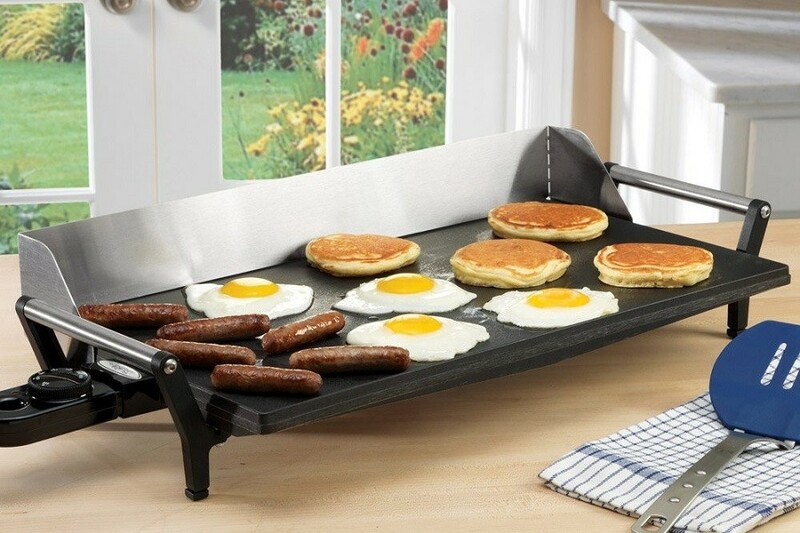 Your average griddle lasts a year, but this one is promised to last at least 3. If you’re still worried, you can buy the 4 year warranty for just above ten bucks or the 3 year warranty for just below 3 bucks. It’s one of the benefits of buying from Amazon. This is a simple griddle, but it’s the top of the line. It’s designed to last much longer than most other griddles but that’s why it’s a little pricier. In the end, the cooking quality makes it worth it. What are you waiting for? Get your Broil King on Amazon today.